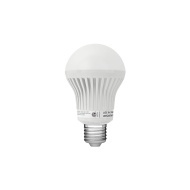 alaTest ha raccolto ed analizzato 9 recensioni su Insteon Remote Control Dimmable LED Bulb. La media della valutazione per questo prodotto è 3.8/5, confrontata con la media della valutazione di 4.7/5 per altri prodotti. Abbiamo analizzato differenti valutazioni di esperti ed utenti, età del prodotto ed altri elementi. A confronto con altri prodotti, Insteon Remote Control Dimmable LED Bulb ha ottenuto un alaScore™ complessivo di 84/100 = qualità Molto buono. Just how bright is Insteon's LED smart bulb? It's programmable, it's dimmable, it's smartphone-friendly, and it'll last you 20 years. The ; is about as easy as home automation gets -- just screw it in, add it to your network of devices, and start scheduling away. With only 8W of energy usage and a life expectancy of 52,000 hours, this is a power-saving bulb built to last. The bulb is only available in one size and one tone, and it isn't quite as bright as we'd like. For smartphone controls, the Insteon app definitely isn't our favorite. At just $29.99 per bulb, this automatable light source will fit nicely into existing home automation networks, serving as an appealing alternative to more expensive dimmer modules and smart switches. The Insteon LED Bulb is about as easy as home automation gets -- just screw it in, add it to your network of devices, and start scheduling away. With only 8W of energy usage and a life expectancy of 52,000 hours, this is a power-saving bulb built to last. The new energy-efficient bulb is controllable via apps and an add-on remote. A new twist on an old favorite and plenty of pre-holiday treats; get a peek at this week’s new and notable releases. These LED bulbs work great! Very easy to integrate to the Insteon Hub. They dim nicely and provide nice soft light. They are bright, but I prefer a softer hue and run them about 50% intensity.